It is unlikely that the Hospitallers occupied the Temple personally; it was merely a source of revenue. But it is equally unlikely that the Temple was let to lawyers as early as Edward II’s reign. The legal profession was still nomadic, and when in the 1330s it migrated en masse to York (with the central courts) the shopkeepers near the Temple complained of a sudden loss of income. The courts returned to Westminster for good early in 1339, and the inns of court as distinct societies probably date from the years immediately following that event. In that very year a man was killed in the Temple by a servant of the apprentices of the king’s court, which suggests that they may already have formed a community there. Ancient tradition dated the legal occupation of the Temple to the 1340s, and it was probably around that time that the outlying land along Chancery Lane – not being required by the lawyer tenants – was alienated to the bishop of Chichester to enlarge the site that later became Lincoln’s Inn. The exact date of formation of the inns of court and chancery will never be known. Unlike colleges at the universities, they were not incorporated or endowed by benefactors, and they did not acquire the freehold of their sites until much later. But it now seems likely that, from the beginning, there were two legal societies in the Temple: one (the ‘inner inn’) using the hall next the cloisters, and the other (the ‘middle inn’) using the unconsecrated buildings between the inner portion and the Outer Temple. 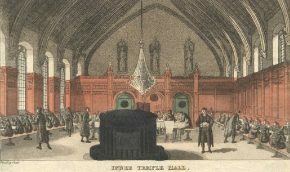 A hall was necessary to an inn of court not merely for meals, but because the legal societies operated from their first formation as academic communities, with lectures and disputations. The two halls in the Temple would therefore naturally have attracted two inns. We do at least know for certain that the Inner Temple and Middle Temple were distinct communities by 1388, when they are first mentioned by those names in a manuscript year book. Little is known of these fourteenth-century societies in the Temple. The best-known incident in their history was the sacking by Wat Tyler’s rebels in 1381, when some of the buildings were pulled down and lawyers’ records burned. The chroniclers of that melancholy event refer to ‘apprentices of law’ in the Temple, but give no details of the legal societies or their buildings. 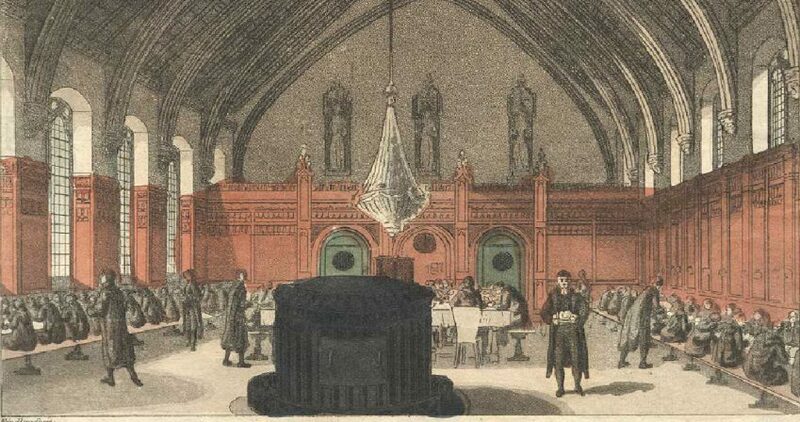 The devastation of 1381 may have been the occasion for rebuilding the Inner Temple hall. At any rate, the little hall which was demolished in 1868, though much altered over time, had a timbered roof of fourteenth-century style; it must therefore have been built by the lawyers rather than by their predecessors. Only five members of the Inner Temple before 1400 are known for sure, but they included the celebrated William Gascoigne, later chief justice of the King’s Bench (d. 1419), remembered by posterity for his judicial courage in committing Prince Henry (later King Henry V) for contempt. A less certain claim has been made for Geoffrey Chaucer, whose name a Tudor antiquary claimed to have seen in the Inn’s archives. Whether or not Chaucer was a member, he evidently knew the Temple well enough; his ‘gentle manciple . . . of a Temple’, portrayed in the prologue to the Canterbury Tales, served a society of ‘masters more than thrice ten’, and presumably a larger community of students. The fifteenth-century Temple is almost equally obscure, since no domestic records survive for either society before 1500. Indeed, the only inn of court to possess records from the fifteenth century is Lincoln’s Inn, whose Black Books (beginning in 1422) provide most of our information about the daily life of the inns at this period. The majority of students were the sons of country gentlemen, not intended for the legal profession. The minority who pursued the severe study of the law were expected to keep the two learning vacations (Lent and Summer) each year, when courses of lectures were given on the old statutes, and also the more relaxed Christmas vacation, when a lord of misrule and his court presided over the festivities. In term-time the students attended Westminster Hall, to watch the courts in action, and throughout the year they took part in lengthy, intricate moots. For these vocational exercises, the hall of each inn was arranged to resemble a court, with a bar and bench. A young student sat inside the bar as an ‘inner barrister’; when he became suitably qualified to argue points of law, he was called to the bar, and as an ‘utter barrister’ stood outside the bar at moots. In due course a barrister would be expected to deliver a lecture (or ‘reading’), after which he sat on the bench at moots as a ‘bencher’. These degrees achieved public recognition in the sixteenth century; but they have remained to this day inns of court degrees, referring to the bar and bench of the inns rather than of the courts. We know from scattered references that the Inner Temple had the same system in the time of Edward IV. The first identifiable Inner Temple reading now surviving was given by Thomas Welles in 1460, though Thomas Littleton is said to have given one before 1453. Thomas Welles is also mentioned as Treasurer in 1484. The first reference to a ‘bencher’ by that title is to one Baker in the 1470s or early 1480s, and the first to a ‘barrister’ is to John Green in 1481. Like the other inns, the Inner Temple seems in this period to have developed its own geographical catchment areas; whereas the Middle Temple was dominated by west countrymen, the Inner Temple drew more from the north, the midlands, and London. It is notable that Richard III’s principal lawyers were all Inner Templars: Sir William Catesby (beheaded in 1485), chancellor of the Exchequer and speaker of the Commons, Sir Morgan Kydwelly (d. 1505), attorney-general, Thomas Lynom (d. c. 1518), solicitor-general, and Thomas Kebell (d. 1500), attorney of the Duchy. Other alumni included John Paston (d. 1466), who lived in the Inn for twenty years and mentioned it in his letters, Sir Thomas Littleton (d. 1481), renowned author of the Tenures, and Sir Richard Sutton (d. 1524), founder of Brasenose College. Two of the earliest named law reporters (John Caryll and John Port) were also Inner Templars.